ANKARA (Reuters) - Turkey said on Friday that a French pledge to help stabilize a region of northern Syria controlled by Kurdish-dominated forces amounted to support for terrorism and could make France a "target of Turkey". French backing for the Syrian Democratic Forces (SDF), spearheaded by the Kurdish YPG militia, has angered Ankara at a time when it is fighting the YPG in northern Syria and considers it a terrorist organization. 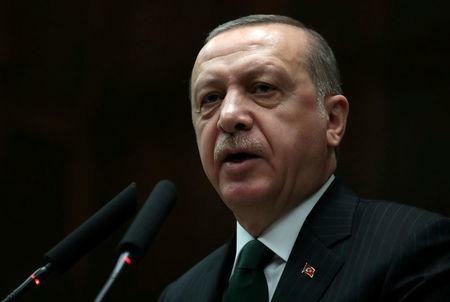 President Tayyip Erdogan said France had taken a "completely wrong approach" on Syria, adding that he exchanged heated words with his French counterpart, Emmanuel Macron, last week. Turkey has long complained about U.S. support for the SDF, among a number of irritants to ties with the leading NATO power. 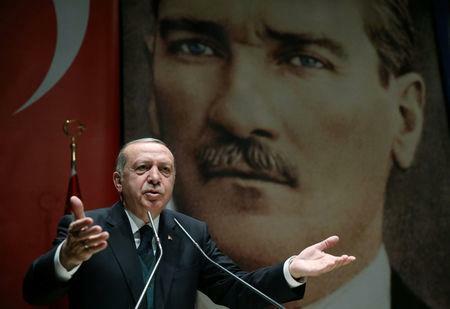 Last year it compared the German and Dutch authorities to Nazis for restricting pro-Erdogan demonstrations during a campaign for a referendum to give him greater powers. The White House said President Donald Trump, who added fresh uncertainty on Thursday when he said that the United States would be "coming out of Syria" very soon, spoke to Erdogan on Friday "to discuss regional developments and the strategic partnership between the United States and Turkey". "The two leaders expressed support for continued efforts to increase cooperation between their two countries, to advance shared interests as NATO allies, and to work through issues that affect the bilateral relationship," a White House statement said. Turkish Deputy Prime Minister Bekir Bozdag said the French stance was setting Paris on a collision course with Ankara. "Those who enter into cooperation and solidarity with terror groups against Turkey ... will, like the terrorists, become a target of Turkey," Bozdag, who is also the Turkish government spokesman, wrote on Twitter. "We hope France does not take such an irrational step." Macron met an SDF delegation on Thursday and gave assurances of French support to stabilize northern Syria. A presidential source later said France could increase its military contribution to the U.S.-led coalition which - alongside the SDF - is fighting Islamic State in Syria. The United States has 2,000 troops in SDF-held territory, and France also has some troops there as part of the coalition. Ankara considers the YPG fighters in the SDF to be an extension of Kurdish militants who have waged a decades-old insurgency in southeast Turkey. Turkish forces drove the YPG from the northwestern Syrian town of Afrin nearly two weeks ago and Erdogan says Ankara is preparing to extend operations along hundreds of miles of border, including areas where the American forces are deployed. The Afrin operation has already drawn international criticism, notably from Macron. Ankara, meanwhile, has said it expects its allies to move their troops out of the way of a Turkish advance. "We have no intention to harm soldiers of allied nations, but we cannot allow terrorists to roam freely (in northern Syria)," Erdogan said. One U.S. service member and one other member of the U.S.-led coalition were killed by a bomb in Syria overnight, the first to die in an attack this year. Trump's remark on Thursday that the United States would be "coming out of Syria" appeared to take his own administration by surprise. U.S. officials have said in recent months that Washington planned to keep an open-ended presence in northern Syria, to support stability in the SDF-controlled region, prevent any Islamic State resurgence and counter Iranian influence. SDF spokesman Kino Gabriel said the force had not been informed of any U.S. withdrawal plan. "Our work and coordination (with the coalition) is continuing," Gabriel told Reuters in a written message. Asked whether U.S. forces had been informed of a decision to withdraw or were preparing to do so, a spokesman for the coalition said he would not comment on future operations. A PYD member in Paris said Macron had promised at Thursday's meeting with the SDF to send more troops to northern Syria, provide humanitarian assistance and push a diplomatic solution. The French presidency did not confirm that Macron had pledged more troops, but the presidential source said France could bolster its military intervention in Syria "within the existing framework" of the U.S.-led coalition. The presidency also said Macron was offering to mediate between Turkey and the SDF - a suggestion Erdogan dismissed. "Do not engage in things beyond you, we do not need a mediator," he said, responding to the French offer in remarks to members of his ruling AK Party in Ankara. "Who are you to speak of mediation between Turkey and a terrorist organization?" Accusing Paris of appeasing terrorism, he said Macron would be held accountable for his policy by his own people. "We hope France doesn't come to us for help when the terrorists running from Syria and Iraq fill their country after being encouraged by their policy," he said. Erdogan spoke last week with Macron about the French president's criticism of Turkey's Afrin campaign. "He was saying weird things and so, even if it was a bit high-octane, I had to tell him some things," Erdogan said. "It is not anyone's place to portray our armed forces as something we do not find acceptable."